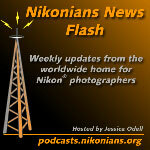 Tune in for what's hot in the Forum of the Week, and find out how you can get your very own Nikonians t-shirt! The merger between Pentax and Hoya, previously announced on News Flash, has come to a halt. Read more about it here. Our friends at LetsGoDigital have highlighed a new digital camera aimed at realtors! The "Best Submission" winner from the March Online Photo Assignment is Derek Jordan, for "St. Hubert's Chapel". Tips on improving your underwater photography. Photos of D200s with underwater housings. Help Nikonian Scuba Doo in his search for new strobes for his D200 rig! Listen in to find out how to get your own Nikonians t-shirt!